Just ordered a new 2014 105 5700 crankset with bottom bracket. First time I've had the new style bottom bracket with the notches on the outside of the cups. Which is the most economical tool to buy (I'm out of money now !!). The installation video I watched used a cup type and a torque wrench. The BBT-9 tool won't take a torque wrench. My friends have not as yet needed one, so I can't 'borrow'. What's my easiest way out, considering that this installation will probably be my last, unless they they have bikes in heaven or the other place. 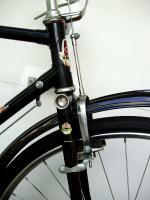 (05-26-2014, 11:28 AM)limey Wrote: Just ordered a new 2014 105 5700 crankset with bottom bracket. First time I've had the new style bottom bracket with the notches on the outside of the cups. Which is the most economical tool to buy (I'm out of money now !!). The installation video I watched used a cup type and a torque wrench. The BBT-9 tool won't take a torque wrench. My friends have not as yet needed one, so I can't 'borrow'. What's my easiest way out, considering that this installation will probably be my last, unless they they have bikes in heaven or the other place. A local bike co-op, or see what the bike shop will charge, or buy the tool, it only costs about $20. Keep it, or resell it for $10 or so. You will probably need the tool again unless you just told us you are terminal. If that is the case I am truly sorry to hear that. Whoa painkiller, situation not that drastic, I'm 75 so I think that the new carbon fiber will be my last hurrah, hopefully twenty years from now !!! I have a good relationship with a local shop, so I will be calling them and I'm sure they will do it for me, hopefully gratis, but if not, I'll see which is the most economic. I started off buying the frame and hoping to use my old 7 speed stuff on it, but it became too complicated, so I bought the groupset and a pair of wheels, the $20 tool might be the last thing that gets my wife up on a murder charge. whew, I feel better now,thanks.